The final alien (sorry, I can’t remember the spelling and didn’t see the name in this issue) has been inside Simon Carr, losing his physical body due to Earth’s atmosphere, and taken by Locus. 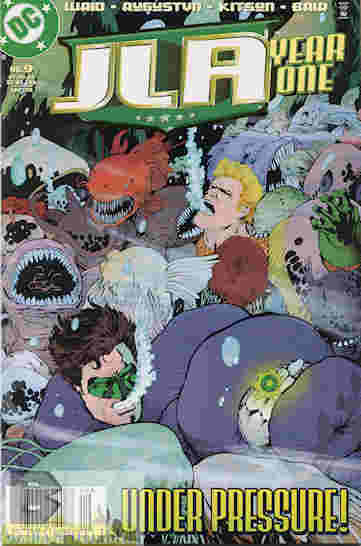 Meanwhile, Snapper has found where Locus is setting up their terraforming gear and the JLA splits up into teams to destroy the machines–Flash and Black Canary in the Arctic while Green Lantern and Aquaman go underwater. Managing to defeat their Locus mutation guards, they meet up to tackle the third machine, which Martian Manhunter is already trying to disable. Still believing he’s with Locus, the others attack and end up setting off the flammable methane gases. And Snapper is attacked by his possessed uncle Simon. What they got right: The character moments are still good, as we learn Flash is considered leader by the others (which is news to Hal) and we get close to the resolution of Barry and Dinah’s situation (though not a conclusion because we still have three issues left to go). The action is also really good. What they got wrong: I would complain about the dumb move on the JLA’s part when they confront J’onn but they’re still new at superheroing and thinking about it I agree it makes sense . Recommendation: Still a good story worth checking out. I hope the last three issues don’t damage the good vibes thus far. Posted by ShadowWing Tronix on December 17, 2018 in DC Spotlight, Yesterday's Comics and tagged Aquaman, Barry Allen, Black Canary, DC Comics, DC Universe, Dinah Lance, Green Lantern, Hal Jordan, J'onn J'onzz, Justice League Of America, Locus, Martian Manhunter, Snapper Carr, The Flash.